Black Currant Essential Oil essential oil has been derived from the black currant plant.The blackcurrant plant (scientific name: Ribes nigrum) is a woody shrub (Family: Grossulariaceae) which usually grows for its berries. as an essential component in nutraceuticals, wines, juices, and jams in China and Europe. Black currant is a stout, woody, usually spineless, deciduous shrub with sharp looking, maple-like leaves and grows to a height of about 1.2 to 2.1 m unless trimmed. These grow in tart clusters during summer. It is the native fruit in the parts of central and northern Europe and northern Asia with a temperate climate, as the plant prefers damp and fertile soils and is cultivated both commercially and domestically in those regions. The fruits are some of the hardest on resistance to cold or changing temperatures. These plants do not thrive in hot or dry climates. Some of the species are fragrant, but some emit a strong, unpleasant odour. In spring, the flowers are yellow and look like small bells growing alternately in a row. It was used as a flavouring and colouring agent. 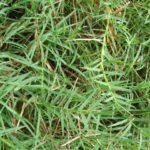 An infusion of the leaves has been used for decades in the treatment of dropsy, rheumatic pain, whooping cough, sore throats, and mouth ulcers. The young roots and bark decoctions also have been used. Black Currant Oil is a very popular health supplement. It is often used to help in case of disorders of the immune system, hair thinning and as an anti-inflammatory agent. The oil from its seeds is also quite nutritious and easily available. It has many medicinal uses. It is a very popular source of GLA (gamma-linoleic acid), which is an essential fatty acid used to treat a variety of ailments, anything from diabetes and ulcers to allergies and cancer. Black Currant Oil is also available as a diet supplement in the form of capsules. Most health benefits of black currant seed oil derive from the original medicinal uses of the plant. Black currant seed oil is obtained by cold pressing the seeds. However, other methods of extraction like solvent extraction and supercritical carbon dioxide are also used. The last two methods do not yield an organic oil as they use chemicals for extracting more oil from the seeds. For getting the maximum health benefits, you should opt for the pure, organic and cold pressed black currant oil. Black currant oil exerts some therapeutic properties which make it a healing oil. It protects the cells from free radical-induced damage. Black currant oil is one of the powerful anti-inflammatory oils which can be ingested in small amounts. ALA, GLA, and stearidonic acid can help in reducing excessive inflammation in your body due to a high intake of unnatural omega-6 fats found in many processed foods. GLA is a popular anti-inflammatory, which is used to treat the swelling and pain associated with arthritis, as well as gastritis, which is inflammation of the stomach. Reports state that black currant oil works reduce inflammation by stimulating the production of prostaglandin-1, which is an anti-inflammatory hormone. Unhealthy diets and lifestyles are the reason behind excessive inflammation, and not one supplement alone can prevent all of these problems. But black currant oil is rich in the right kind of fatty acids to help swing the balance back a bit further in the right direction. It exerts a protective effect on your heart and the blood vessels. The herb, berries, and the black currant seed oil are good for improving the functioning of your immune system. It treats dermatitis in human beings and also canines. Black currant seed oil is one of the best anti-rheumatic oils. It reduces the pain of rheumatoid arthritis. It reduces the susceptibility of the person to allergies. Gamma-linolenic acid from black currant oil has protective effects in case of diabetic neuropathy. There may be other possible therapeutic properties of black currant oil like Anti-cancer, Diuretic, Anti-diarrheal and more which might become evident with further research. Our skin is also highly sensitive to a deficiency in important fats, particularly omega-3 fatty acids. Black currant oil is often said to help with inflammatory skin diseases like acne, eczema, and even psoriasis. Additionally, gamma linoleic acid is helpful in melanin production and may also help normalise pigmentation problems like age spots and uneven skin coloration. Black currant seed oil is effective in lessening the severity of atopic dermatitis. It is taken internally and not applied topically. With regular use, you will experience the lesions of eczema or psoriasis healing. You will also notice a reduction in itching or pruritus in the lesions. As a result, the person scratches less which reduces inflammation in the lesions. This is due to the presence of healthy fatty acids in black currant seed oil, like alpha-linolenic acid, gamma linolenic acid and di-homo-gamma-linolenic acid. Its use also helps in case of excessive dryness of skin, thus preventing scales and flaking. Its antioxidant and anti-inflammatory effects are known to help ease the symptoms of psoriasis. Psoriasis is an auto-immune disease. Symptoms include red, raised scaly patches on the skin. The patches often itch, burn, and sting. Taken orally, blackcurrant seed oil can help decelerate the growth and development of psoriatic patches. It also can be applied directly to dry, itchy skin. 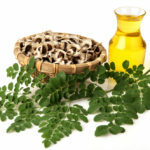 The Moringa oil is also considered miraculous to treat skin problems. Black currant seed oil is an unusually powerful nutritional oil with too many health benefits. Gamma, linoleic acid in black currant seed oil, may help treat and prevent thinning hair. Androgenic alopecia is a form of hair loss that can be seen in both men and women. In men, the condition is also known as pattern baldness and leads a receding hairline, less hair on the top part of the head and eventual baldness with age. For women, androgenic alopecia has effects like thinning hair over the entire scalp, with hair loss mostly in the crown region. There are many factors that can lead you to lose your hair, but a deficiency in certain important fatty acids is a common one. This is where black currant oil can help you find an all round solution.The seeds of black currants are very rich in 3 very valuable fatty acids for healthier hair and also better health in general. Black currant oil contains huge levels of gamma linoleic acid, alpha-linolenic acid and stearidonic acid. Blackcurrant seed oil contains gamma-linolenic acid (GLA), a type of omega-6 fatty acid that’s been said to help to get relief inflammation in the body. GLA may help in case of joint pain, stiffness, and soreness in people with Rheumatoid Arthritis (RA). Rheumatoid Arthritis is a disease in which people’s immune systems attack their joints, causing chronic inflammation. In some studies, GLA supplements were so very effective that patients suffering from Rheumatoid Arthritis could replace their usual pain medications. Supplementation with black currant oil has been shown to increase the immune system functioning by a moderate amount. As you grow older, the production of prostaglandin E 2 in your body increases. This leads to a decrease in immune function because of lower T-cell function. Black currant oil provides your body with gamma-linolenic acid and alpha linolenic acid ( omega -3 ) which reduces prostaglandin synthesis. As a result, the overall performance of your immune system improves. As a result, regular supplementation with black currant seed oil can help your body deal with pathogens, for example, infections caused by bacteria, virus or fungi. You can also use it to recover faster from flu and cold. It also helps in auto-immune problems like lupus, eczema, and psoriasis. Black currant oil is said to have a positive effect on the serum lipid profiles of a person. The oil supplements, when used, were found to reduce LDL cholesterol levels. Black currant seed oil is very helpful for cardiovascular health. It can lessen the risk of heart diseases like atherosclerosis. 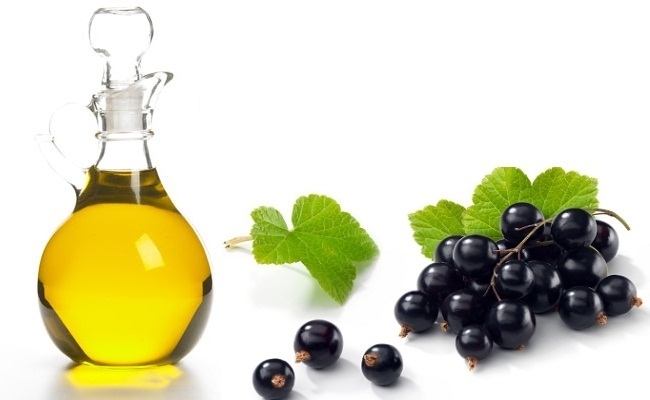 Black currant oil has also been found to be quite helpful in preventing cardiac arrhythmia. In this case, the heart beats without its normal rhythm because of lower blood supply to the heart. Black currant seed oil helps to reduce the risk of acquiring this condition. It has been proved to be even better than primrose oil in, seemingly because of greater omega-3 concentration in black currant seed oil. GLA (found in black currant seed oil) can lower your blood pressure when combined with the diet with eicosapentaenoic acid (EPA) and docosahexaenoic acid (DHA). Other than dropping blood pressure, the GLA in black currant oil keeps cells in your heart from damage and also decelerates platelet clumping in your blood vessels. When the platelets in the blood clump together, this can increase the risk of heart attack or stroke. People who suffer from chronic dry eyes find relief by taking black currant seed oil. This is because low levels of healthy fatty acids can lead to lower production of tears, which usually leads to the dry eyes condition. First, the highly colored plant pigments nourish the retina. Night vision depends on your retina’s ability to regenerate the visual purple (rhodopsin) continuously, and anthocyanins serve as the “building blocks” for this important substance. When subjects with normal vision were provided with black currant extract, it was found the acuity of their night time vision improved, as did the speed at which they adjusted to the darkness and the rate at which they recovered from blinding glare. Another benefit involves the inducement of short distance/myopic vision and its aggravation or exacerbation if already present. Continuous close range visual exertion, such as continuously working on computers, will eventually lead to the development of tension of the ciliary smooth muscle, which might impair your eye’s refractory adjustment function. This might result in axial length elongation, a type of Myopia or “nearsightedness.” Blackcurrant extracts might help counter axial length elongation. Also related to the ciliary smooth muscle tension is visual fatigue. As most you who use the computer very much, the fatigue of the eyes can extend to the neck, head, arms, shoulders and lower back. Anthocyanin ingestion may be helpful in this case too. Several types of problems that come with the aging eyes, such as cataracts and macular degeneration, seem to be affected by the rate of production of free radicals.In laboratory trials, changing the diets from commercial laboratory chow to “well-defined” diets rich in flavonoids has shown to be of help. Interesting results have been found in the case of human trials in which anthocyanins were used as the supplement, either alone or with vitamin E.
Black currant oil also helps a lot in premenstrual syndrome. It alleviates the symptom of this situation like mood swings, irritability, depression, insomnia, body pains and weight gain due to fluid retention. Black currant oil also helps in menopause as it lessens hot flashes and night sweats. You can take GLA supplements to help in case of recurrence acne. Though we must caution you that while in some people, it helps; in others, it might worsen the acne. But it contains high amounts of GLA as well as ALA ( omega -3 as we know ). Because of high omega-3, it usually reduces inflammation and redness on skin besides reducing the acne breakouts. Black currant seed oil is very beneficial in rheumatoid arthritis. It reduces swelling, pain and joint injury in people suffering from arthritis. This effect does not come up immediately. You can also go through the article saying natural remedies for osteoarthritis and know different treatments to cure it. It is a rather slow process, and so it can take up to 24 weeks for significant relief from arthritis. This oil also helps in reducing inflammation that occurs in the case of gout. As you grow old, there is an increase in the generation of prostaglandin E2 in the body. Though this compound is essential for functions like muscle contraction, if there is too much of it, it can have adverse effects on your immune system, and can also increase the risk of age-related diseases. Combining with black currant oil helps to lessen the generation of prostaglandin E2, thereby boosting the immune system function of the aging. The Maracuja oil can also be used to counter anti-aging effects. One of the more unexpected benefits of blackcurrant extract is in the area of digestive health. When scientists at Massey University of New Zealand used an animal model to examine the ”impact of supplementation of the diet with insulin, 30 percent anthocyanin extract concentrate (BCE) or cassis infused dried fruit (IDF),” they found many significant results. Desirable bacteria, in this test that is Bifidobacteria and Lactobacilli, were increased and unwanted gut inhabitants, like Bacteroides and Clostridia, were reduced. Other researchers have found that black currant may support gastrointestinal health by lessening the activity of â-glucuronidase and increasing that of â-glucosidase. Black currant oil contains proanthocyanidins as well as anthocyanins and other polyphenolic compounds. Work performed at The Plant and Food Research Institute of New Zealand examined the impact of black currant extract on immune function and aspects of normal inflammatory response when the lungs are challenged. The researchers found that black currant supported normal inflammatory and immune responses under challenge conditions. Researchers have suggested black currant extracts may be supportive in conditions such as asthma. The black currant seed oil provides both the omega-3 fatty acid alpha-linolenic acid (ALA) and the omega-6 fatty acid gamma linolenic acid (GLA). GLA is one of the “good” essential fatty acids which is often used to enhance cell membrane fluidity and function. Although the body can manufacture GLA from dietary linoleic acid, it can better use when put to use for body functions when supplied directly by dietary sources. GLA supports a balanced inflammatory response and has been known to be important for lung, joint, and eye health. According to doctors like Andrew Weil, MD, the combination of essential fatty acids found in black currant seeds might affect the production of prostaglandins and help in hormone production to support women during menopause. One of the distinct benefits of black currant oil is its anti-viral properties. Black currant oil particularly protects against the influenza virus. Scientists in Japan state that the growth of influenza virus A and B is completely suppressed when exposed to Black Currant Oil. 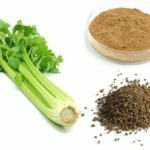 Also, it prevents the virus from being released from the damaged cells and spreading to the other good cells of the body. Black currant has been used in traditional medicine for ages to cure influenza, colds, and sinusitis, and has been claimed to have antiviral activity against influenza and herpes simplex. Many of you might be familiar with these uses. However, relatively few individuals are aware of the fact that many anthocyanins are active against viruses. Researchers at the Department of Microbiology, Asahikawa Medical College in Japan looked at the effects of black currant against influenza virus types A and B in vitro. According to the study results, “both IVA and IVB were inactivated up to 99.9 percent by ten ìg/ml of the black currant extract at pH 2.8, and 95 to 98 percent by this concentration at pH 7.2”. The “growth of IVA in cells treated with 10 and 100 ìg/ ml of the extract after infection was completely suppressed in six hours”. The results indicated that the extract was effective under test conditions in inhibiting the release of the virus from infected cells. 100 gm of oil contains About 10 gm Saturated Fats. 9 – 13 gm Oleic Acid ( omega-9 ) MUFA ( monounsaturated fatty acid) Rest of it is PUFA ( polyunsaturated fatty acids ) Black currant seed oil contains about 15 – 20 gm of gamma linoleic acid and about 12 – 14 gm of alpha-linoleic acid ( omega -3 ). These two nutrients are strongly anti-inflammatory agents and impart most of the health benefits. Linoleic Acid is omega – 6, and it is the principal fatty acid in this oil. Omega-6 is about 44 – 51 %. This fatty acid is pro-inflammatory. This is why, intake of higher amount of black currant seed oil may aggravate inflammation in the body whereas when taken in a small amount, it is strongly anti-inflammatory. In most commercial black currant seed oil, gamma-linolenic acid concentration is increased using a process called refinement. This oil has a significant amount of Vitamin E. However; it is disproportionately divided among tocopherols and tocotrienols. Most of the Vitamin E in black currant seed oil is found only in tocopherol forms. a – Tocopherol – 36.9 g/kg ? – Tocopherol – 55.4 g/kg d – Tocopherol – 6.9 g/kg Due to the Vitamin E, it provides the health benefits of this Vitamin to the oil extract. Black currant seed oil thus also acts as an antioxidant. It protects the nerves from being damaged and also safeguards gene expression, which are all functions of Vitamin E.
The oil also contains small amounts of plant sterol compounds, also known as phytosterols. These render health benefits even when used in small concentrations. These are the phytosterols found in black currant seed oil. It is strongly anti-inflammatory and lowers the destruction of cartilage in arthritis. This is an Anti-cancerous compound. It reduces the blood glucose and exerts an effect on the thyroid hormone. This phytosterol reduces cholesterol levels in the blood. Black currant seed oil should only be taken under its safe dosage value. If taken in excess, it can lead to minor side effects like headaches and upset stomach problems like diarrhoea or constipation. Some people have been known to develop an allergy to black currant products. It also has an anti-clotting effect so that it can aggravate bleeding. This oil should not be taken two weeks before and after surgery. You should maintain the dosage of black currant seed oil under 1000 mg ( 1 gm ) per day for adults and 500 mg for kids. Although people might take higher amounts, up to 6 gm per day, that can lead to side effects. You should consult the doctor before taking high amounts of black currant seed oil. It should strictly not be taken during pregnancy. 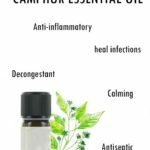 If you are on medication, consult your doctor about its possible interactions with this oil. Black currant oil supplements can be the cause of soft stools, mild diarrhoea, and intestinal gas in some people. Not enough is known about dried blackcurrant leaves to write about their safety. Women who are pregnant or breastfeeding should consult with their doctor before taking any supplements, including blackcurrant. Black currant seed oil is available in bottles as well as in capsules in medicine stores. You should check the source and method of preparation of oil. These supplements are usually added with antioxidants to prevent this oil from getting rancid. You should keep the products away from sunlight, preferably in cool and dark place. To growing your blackcurrant bushes, you need to know a few easy tricks. They grow well at winter temperatures as low as zero degrees centigrade. You will need to choose a sunny location and add compost or well-rotted manure to the hole in the ground before planting. You must make sure to add two to four inches of mulch around the plants as they usually thrive in cool, moist soil. Pick your black currants while they are dry and still firm. If you do not want to use them immediately, they can be refrigerated and will last up to a few weeks. Posted in Black Currant Oil Health Benefits, Herb Information, Herb Information Benefits, Herbal Home Remedies, Oils and tagged Black Currant - Health Benefits - Uses, Black Currant Oil - Health Benefits - Uses.